One of the realities imposed by Tuesday is that we're going to have to get creative. 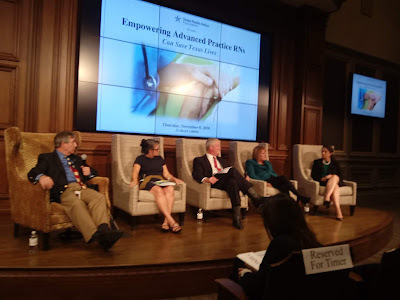 This afternoon, TPPF's discussion "Empowering Advanced RN's can save Texas lives" offers one such possibility. Scope-of-practice reform. Texas currently has a shortage of health care providers across the state. 36 counties have zero physicians. 80 counties have five physicians or fewer. While this is often a problem in rural areas, there are parts of the cities that aren't much better. East Austin and East Houston are the two most obvious examples. Given the geographically dispersed nature of the issue, a broad based coalition is emerging to promote "scope of practice" reform. TPPF has been joined by the AARP and the left-leaning Center for Public Policy Priorities. The proposed reforms would enable nurse practitioners to perform many functions currently limited to licensed physicians. Supporters made fairly standard free-market arguments in favor of the reforms. Fewer regulations will mean more providers. More providers means more competition which means more options at lower prices for health care consumers. This is an interesting issue for next session. As we made clear back in February, and as today's event reinforced, there's support for this across the political spectrum. Therein lies opportunity. Several months ago we spoke with a senior Democrat in the Texas house. She expressed support. Given the reality of vote totals next session, that's worth considering. In some communities, increasing the supply of medical providers is literally a lifeline. It's worth noting, though it might not mean much, that the Texas "Medical" Association representative on today's panel was less obstinate than members of that organization we've seen discuss this issue previously. Bottom Line: If you can take a modest, but tangible, step to lower health care costs, you should. That's especially true next session. Scope-of-practice reform is a lower profile issue, but it's one that could be powerful.